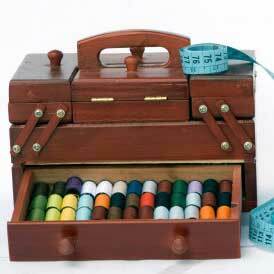 Give gifts with a personal touch with great sewing gift ideas from this FREE eBook! Never stress about gift-giving again! With so many presents to give around the holidays, you can't go wrong with a bottle of wine. Add a personal touch with this Happy Holidays DIY Wine bag. This DIY gift bag will make your present festive and thoughtful. This tutorial uses printed holiday burlap, but if you're feeling artistic, you can use plain fabric and decorate it yourself. A bright ribbon completes your bag and gives it a polished look. In just a few minutes and even fewer stitches, you'll have a rustic, charming Christmas wine bag that your family and friends will love. For more Christmas crafts, check out Christmas Sewing Projects: 44 Ideas for Christmas Ornaments, Clothes, and More. The homespun look of burlap for this sewing project is rustic and endearing. The sewing instruction to make this wine bottle covering is easy for anyone to do. A gift of wine looks much more elegant if wrapped in a DIY bag. Thrifty plain burlap could be stamped with a seasonal design for a personal touch as well.